On 7 November 1606 the Enkhuizen chamber of the Dutch East India Company delivered a receipt to Jan Brouwer for the payment of 500 guilders. It was the last (twelfth) part of a share of 6000 guilders. Converted to present-day purchasing power it would be worth more than €100,000. Three years later this citizen of Monnickendam (a small town near Amsterdam) was rewarded with a considerable dividend: a load of pepper worth 1350 guilders. Already in the sixteenth century Italian ship owners issued shares, but the Dutch East India Company - founded in 1602 - was the first company whose shares were negotiable. Previously, a final settlement of accounts always took place after every separate voyage, but this time the shares fell due only after ten years. Any investor who wanted to cash in earlier could sell his share. Incidentally, even in 1612 there was no settlement of accounts, the States-General having granted dispensation. Real, printed share certificates did not exist and no dividend was paid to the mere bearer of a receipt. The payments were based on the registers of shareholders of the six chambers of the Dutch East India Company, in which the investments of all stakeholders were recorded meticulously. The Enkhuizen register is lost, but those of Amsterdam en Middelburg have been preserved. In Enkhuizen the total amount of investments was 540,000 guilders; in Amsterdam it was nearly seven times as much. For want of a better term one could call this receipt a share certificate. Another receipt of its kind, dated 9 September 1606, is preserved in the West-Friesland archive in Hoorn. It is generally considered to be the world’s oldest share certificate. In that case the Leiden specimen would be the oldest but one. But there are even older documents. The registers also contain entries of the transfer of shares from one investor to the other. 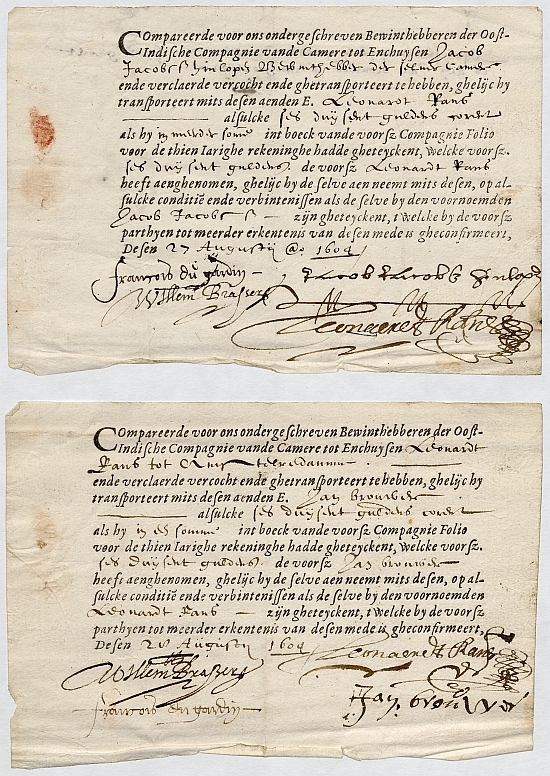 On 27 August 1604 the Enkhuizen chamber issued a certificate of the transfer of a share of 6000 guilders to Leonardt Rans, and the next day a second one of the transfer of probably the same share to the above-mentioned Jan Brouwer. Wouldn’t these documents qualify as the world’s oldest share certificates? These documents belong to the papers of Hans Thijs (1556-1611), a merchant of Amsterdam and a large shareholder of the Dutch East India Company. They are kept in the Leiden University Library as part of the archives of the Bibliotheca Thysiana (ATH 308). Post by Arend Pietersma, former curator of Archives at Leiden University Libraries.